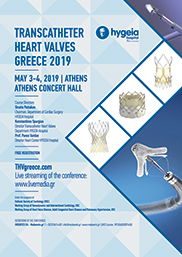 The Transcatheter Heart Valves Greece 2019 will be held at the Athens Concert Hall, on May 3-4, 2019. Course Directors of the Conference are Stratis Pattakos, Chairman, Cardiac Surgery Department, Hygeia Hospital, Konstantinos Spargias, Director, Department of Transcatheter Heart Valves, Hygeia Hospital and Prof. Panos Vardas, Chairman of Heart Sector, Hygeia Hospitals Group. They welcome you, after the success of the 7 past meetings, as they feel they should continue this effort to educate, update, interact and demonstrate the latest developments in this cutting edge area of Interventional Cardiology/Cardiac Surgery.